He's bonkers. 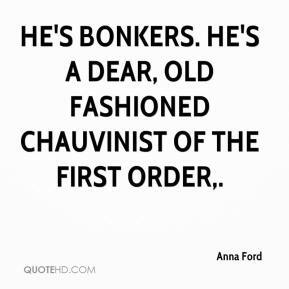 He's a dear, old fashioned chauvinist of the first order. 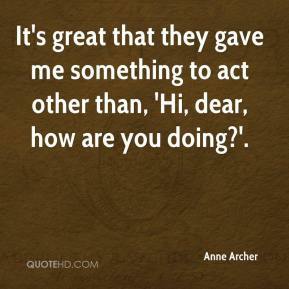 It's great that they gave me something to act other than, 'Hi, dear, how are you doing?'. 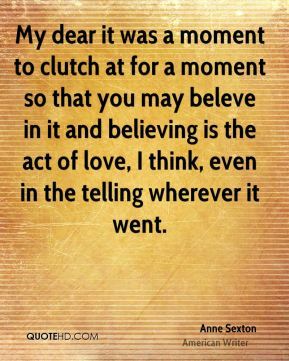 My dear it was a moment to clutch at for a moment so that you may beleve in it and believing is the act of love, I think, even in the telling wherever it went. 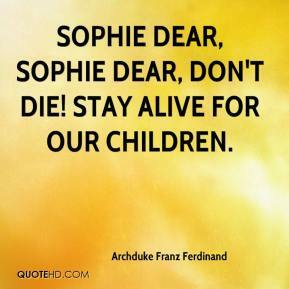 Sophie dear, Sophie dear, don't die! Stay alive for our children. Dear God. 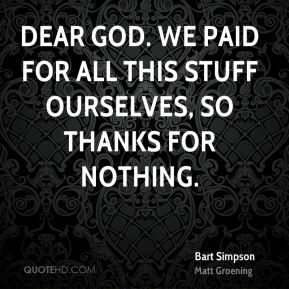 We paid for all this stuff ourselves, so thanks for nothing. Dear God, let me be something every minute of every hour of my life. Let me be gay; let me be sad. Let me be cold; let me be warm. Let me be hungry...have too much to eat. 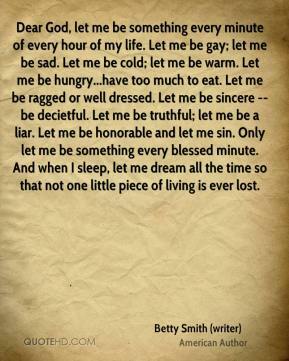 Let me be ragged or well dressed. 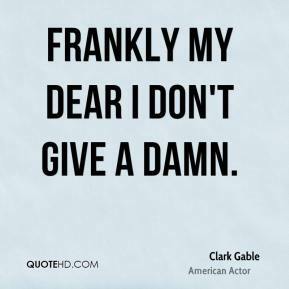 Let me be sincere -- be decietful. Let me be truthful; let me be a liar. Let me be honorable and let me sin. Only let me be something every blessed minute. And when I sleep, let me dream all the time so that not one little piece of living is ever lost. She's such a dear friend. 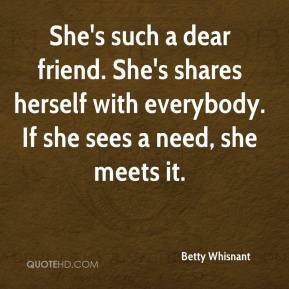 She's shares herself with everybody. If she sees a need, she meets it. 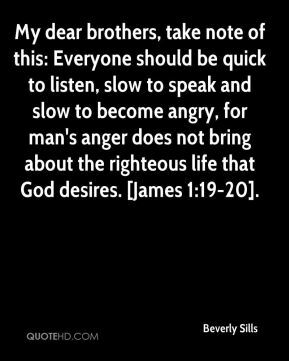 My dear brothers, take note of this: Everyone should be quick to listen, slow to speak and slow to become angry, for man's anger does not bring about the righteous life that God desires. 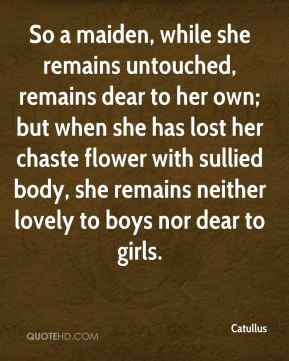 [James 1:19-20]. Oh the shark has pretty teeth, dear, / And he shows them pearly white. 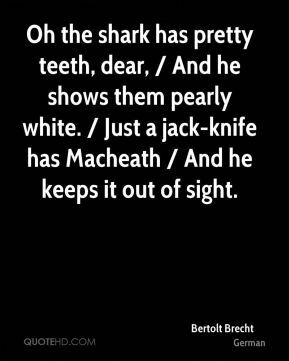 / Just a jack-knife has Macheath / And he keeps it out of sight. 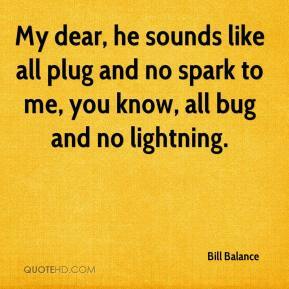 My dear, he sounds like all plug and no spark to me, you know, all bug and no lightning. 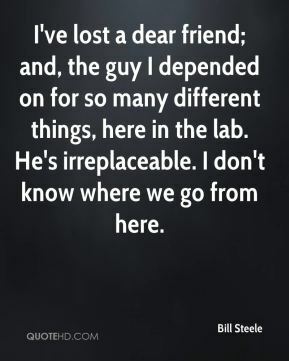 I've lost a dear friend; and, the guy I depended on for so many different things, here in the lab. He's irreplaceable. I don't know where we go from here. 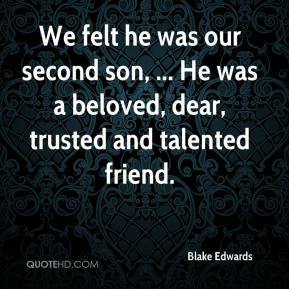 We felt he was our second son, ... 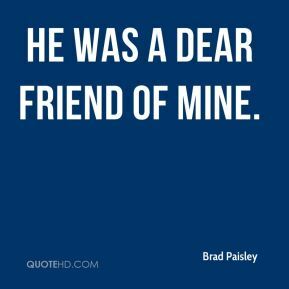 He was a beloved, dear, trusted and talented friend. 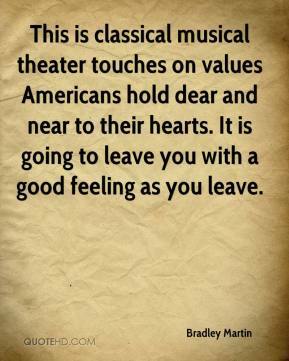 This is classical musical theater touches on values Americans hold dear and near to their hearts. It is going to leave you with a good feeling as you leave. 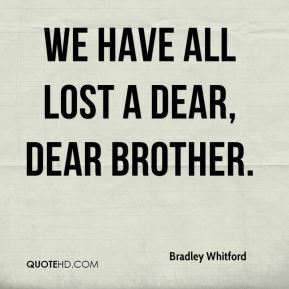 We have all lost a dear, dear brother. My time at Wofford was very dear to me. I chose to go there because the academics were so strong. 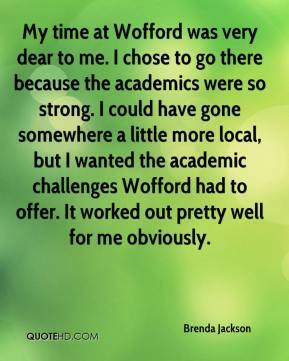 I could have gone somewhere a little more local, but I wanted the academic challenges Wofford had to offer. It worked out pretty well for me obviously. It's definitely something that we hold near and dear to our heart. 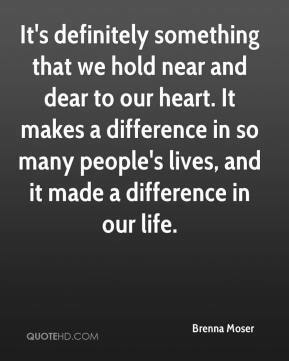 It makes a difference in so many people's lives, and it made a difference in our life. 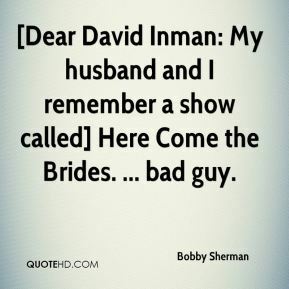 [Dear David Inman: My husband and I remember a show called] Here Come the Brides. ... bad guy. 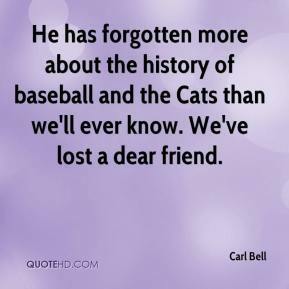 He has forgotten more about the history of baseball and the Cats than we'll ever know. We've lost a dear friend. 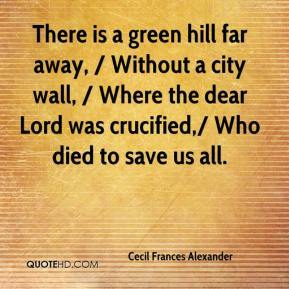 There is a green hill far away, / Without a city wall, / Where the dear Lord was crucified,/ Who died to save us all. 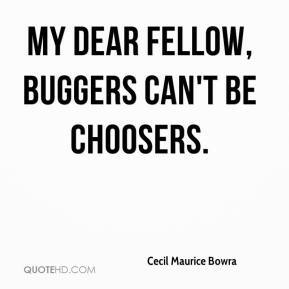 My dear fellow, buggers can't be choosers. 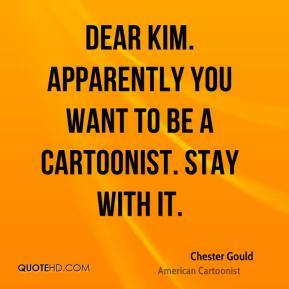 Dear Kim. Apparently you want to be a cartoonist. Stay with it. I love Simon Cowell, he's a dear friend.